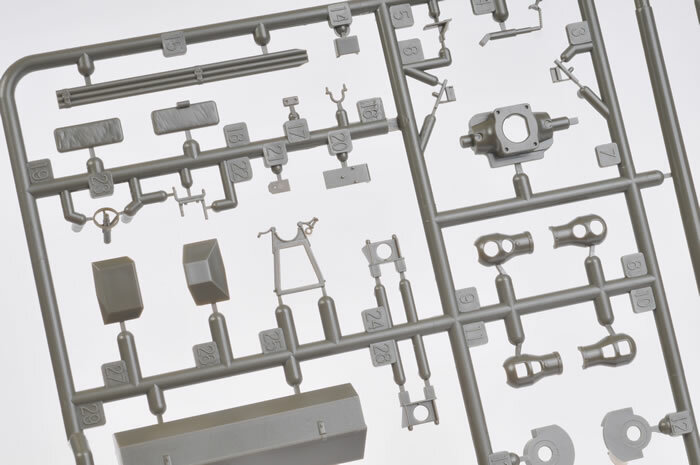 Tasca is known as a manufacturer of superbly engineered and well detailed Sherman kits amongst we Allied modellers and particularly that unique breed, the Shermaholic. This Sherman Mk.Ic Firefly Hybrid is their latest foray into the breed and the first of an M4 variant (hopefully the first of many) albeit as a Firefly conversion. The Firefly was one of the most important British AFV’s in the later war period and was the result of the mating of the excellent British QF 17 pdr gun to the readily available and reliable Sherman Tank. This gave the British Armoured formations some much needed hitting power when it was so desperately needed. The M4 and the M4A4 variants were selected as suitable for conversion and by war’s end approx 2139 of the 3000+ ordered had been converted although this figure is possibly a bit low due to incomplete records. Conversions were undertaken on M4 and M4A4 variants only as the M4A1, 2 and 3 were deemed unsuitable due to turret traverse gear fitted and hull layout problems. The M4 was originally a welded hull design with a 56 degree glacis and protruding hoods for the Driver and Bow Operator Gunner – Co Driver. This was found to be a liability as the hoods were shell traps and ways were sought to overcome this. The M4A1 Sherman had a cast Hull which was thought to be more ballistically sound however there wasn’t enough manufacturing capacity for such large castings. Chrysler came up with a composite using the forward casting of the (mainly) large hatch M4A1 welded to the fabricated rear of the M4. 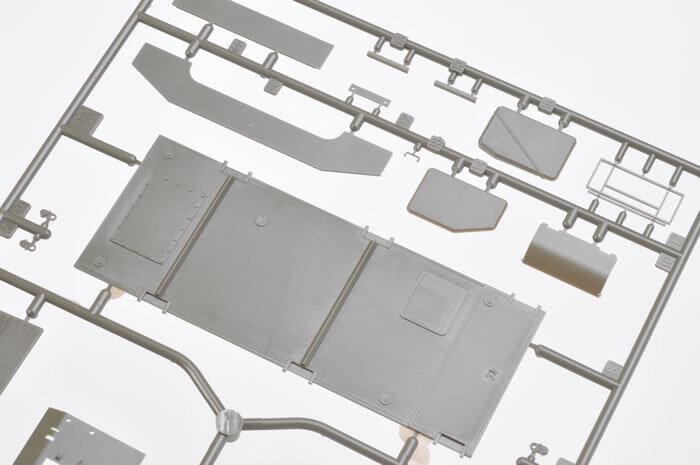 This replaced the earlier welded hull in production alongside the revised all welded 47 deg large hatch M4 Hull which was only used for the M4 105mm Assault gun tanks. Most of the Composite Shermans were produced from late 43 and as such were fitted with the mid production Low Bustle turret which no longer had the pistol port on the left rear side and had a thickened right cheek to compensate for the machined out interior and restore the armour thickness. As production continued the later High Bustle turret which also had a loaders hatch was introduced and many late production Firefly 1c’s were fitted with such a turret. The 1c Firefly was used by the British, Canadians, Polish, Czechs and New Zealanders. A handful were supplied to the US very late in the war but it is doubtful they saw any combat. 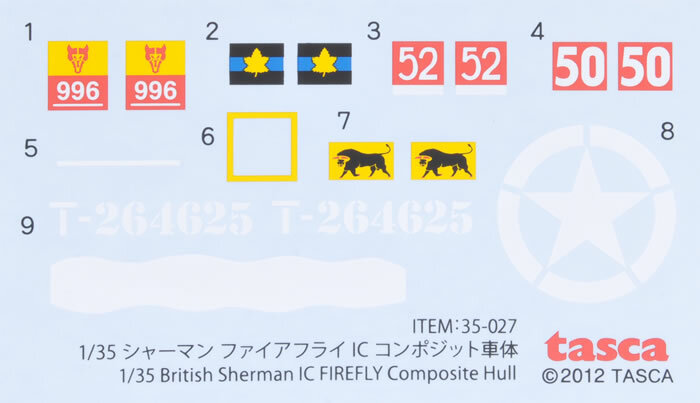 Tasca is not the first to offer a Composite Hulled Firefly which the British named the Firely 1c (Hybrid) with the Sherman 1 being the British designation for an M4 and I found myself comparing this release with the recent DML release to which it has some differences. 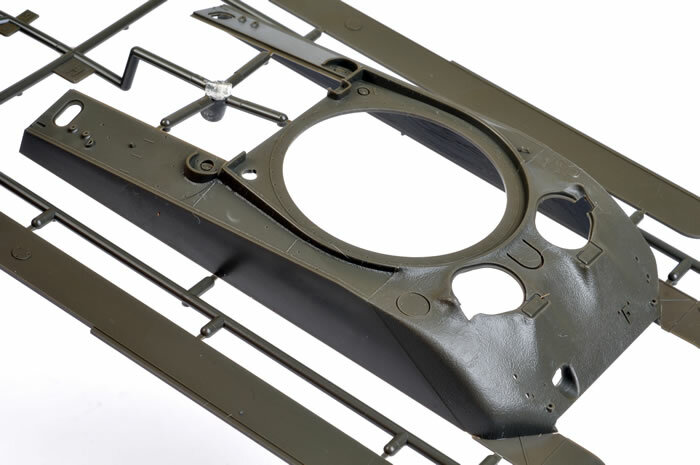 The variant depicted in this kit is fairly typical for the early Firefly 1c Hybrid and has a low bustle mid production turret (as is the DML kit). 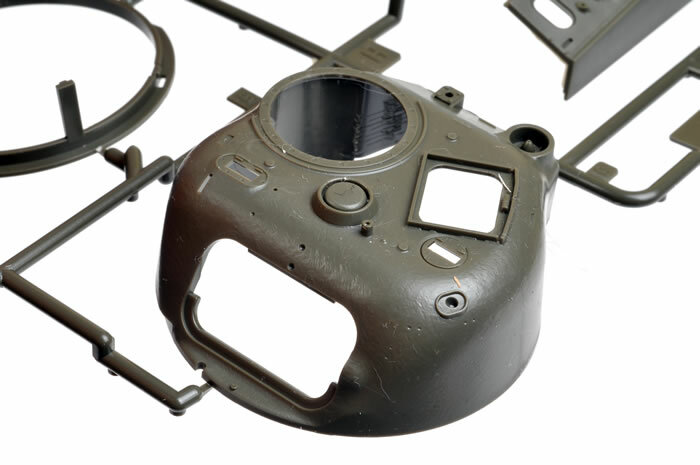 The kit comprises approx 540 parts in an Olive Drab styrene although many of these are not used and a large number of very useful spares will be left over for other Sherman projects. 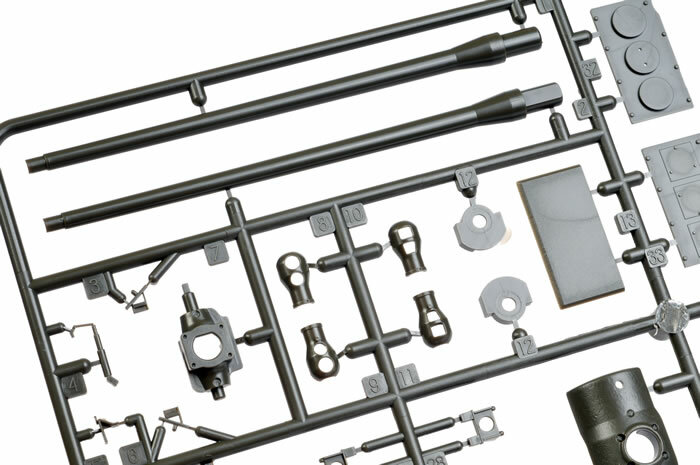 As is the norm for a TASCA Sherman kit clear parts and PE are also included. 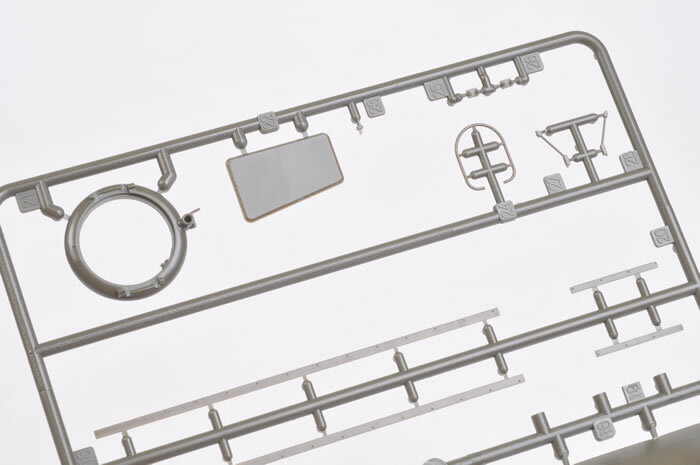 Most of the kit is made from existing Tasca Sprues however a new non riveted lower hull is supplied and a new late transmission cover. 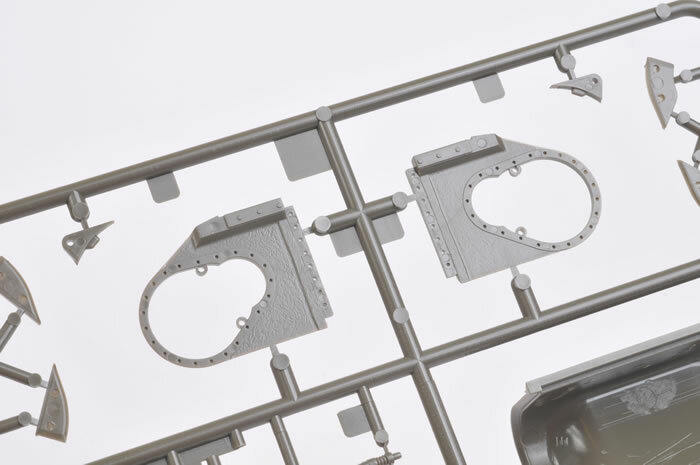 Tasca has been listening and now offers plastic blocks as an alternative to the foam sheet used in the suspension if you do not want it to articulate like the real thing. This is a good idea as it is very difficult to get it correct and the suspension sags over time. The Firefly turret is very well done although I noticed there were no casting marks which are prominent on the bustle of the real thing. This is same turret included in Tasca's 35-011 VC Firefly and includes the thickened cheek of the mid production Low Bustle turret. The three types of radio box lids are included and the kit offers the D69993 Commander's cupola, which I do not believe Tasca has offered before. Two types of muzzle brakes are included along with a superbly moulded B set antenna base with protective ring. 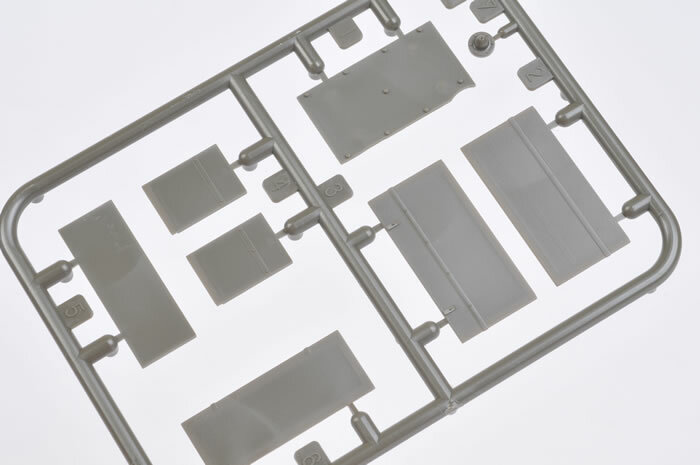 Periscopes are included as either OD plastic or clear plastic and PE persicope guards are included. 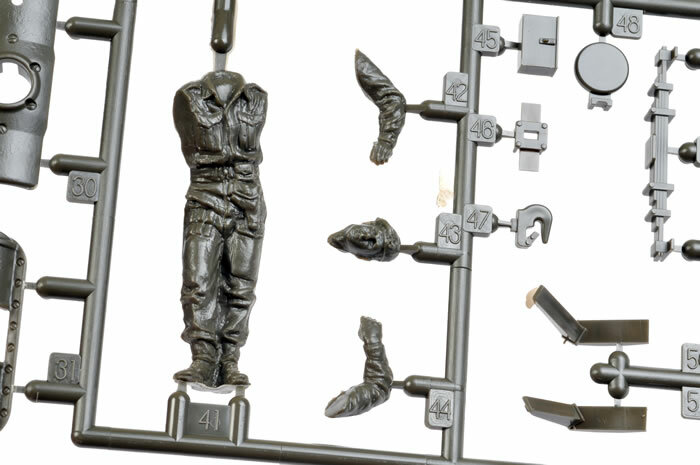 The standard British stowage box is also included as well as a full figure of the tank Commander in beret and denim overalls. The excellent Taaca .50 cal is not included. 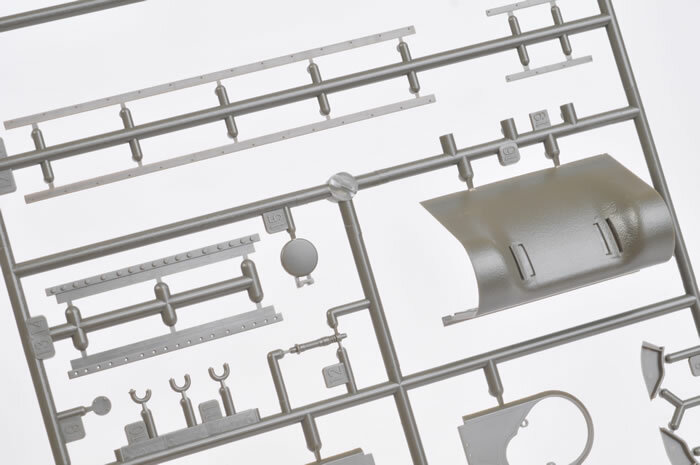 The hull is the major feature of this kit and the cast section follows the contours of the real thing well and compares very well to photos of the real thing although it is missing the main frontal ID feature of a hybrid hull which is the small cast bumps on the lower and upper central glacis. These can be easily added and in all honesty the upper one will be covered by the gun crutch. The cast effect is subtle and on par with effect in earlier Tasca Shermans. Cast numbers match perfectly in position and layout to the example I have had access to but there are none are on the transmission housing. 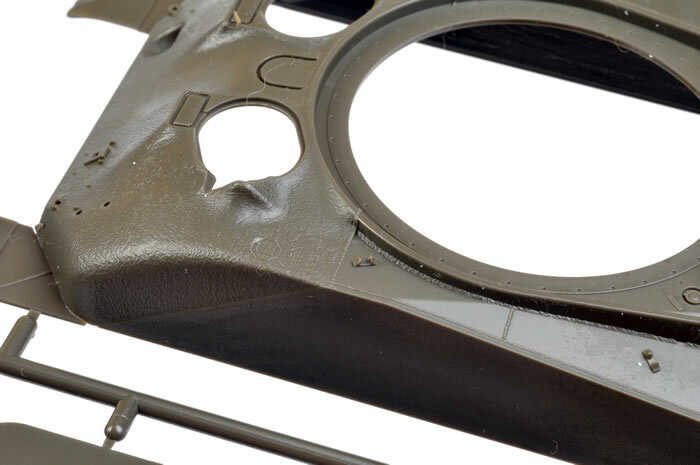 The upper hull welds are very well done but just a bit light where the cast Glacis is joined to the welded hull. Like most Tasca Shermans they have omitted the welds that join the glacis to the hull sides and this is particularly noticeable on the composite hull. The Appliqué plates have the welds already included but to me are understated. I particularly appreciated the RHS appliqué is shaped to the hull contours mimicking the weld fill between the hull and the appliqué. 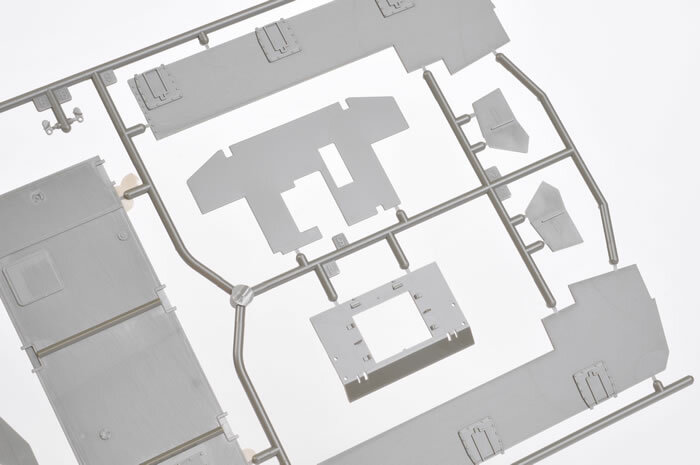 The rear of the hull is detailed and has the exhaust deflector plate and mesh screening found under the rear hull overhang which is finely done with the frame as a separate part to the PE. Both Round and Square Air Filters are included along with a British Tow Bar although there is no mention of this in the instructions. A full set of both upswept (late) and horizontal return roller arm bogies are included and full sets of spoked, pressed and dished roadwheels are also included. 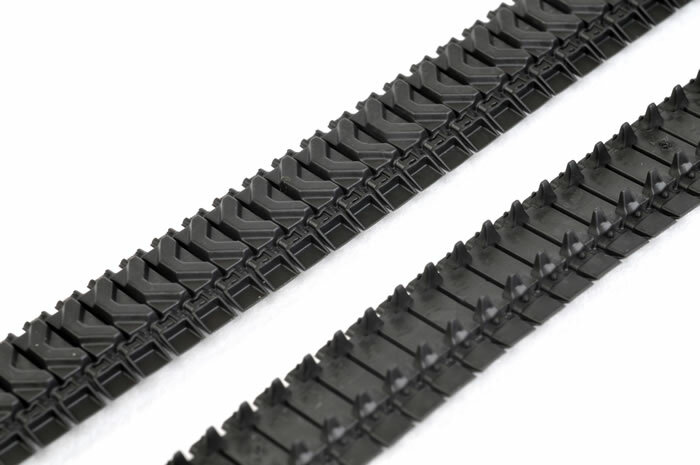 Two styles of track skids are supplied. 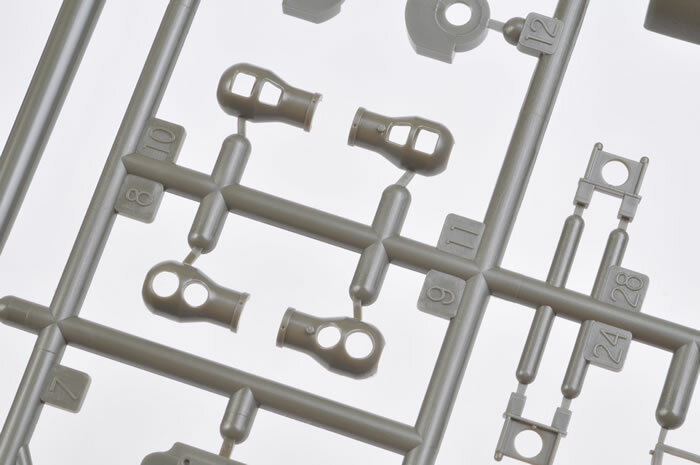 The tracks represent the T48 Rubber Chevron type which was commonly seen on Chrysler supplied M4’s. 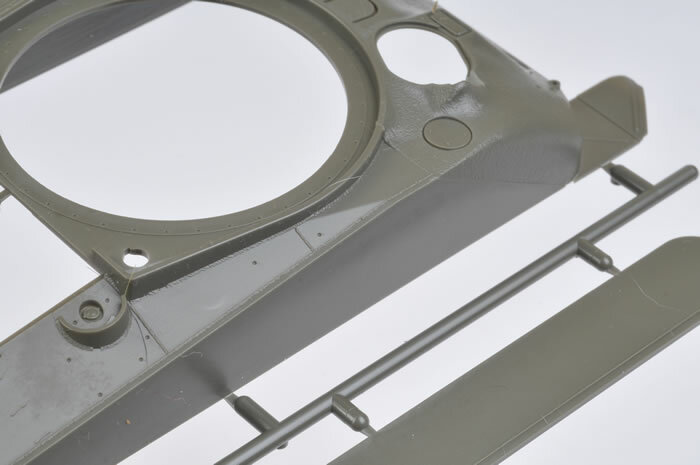 These are in the two sections per run and have Extended End Connectors fitted which should be removed or substituted for a Normandy era vehicle. 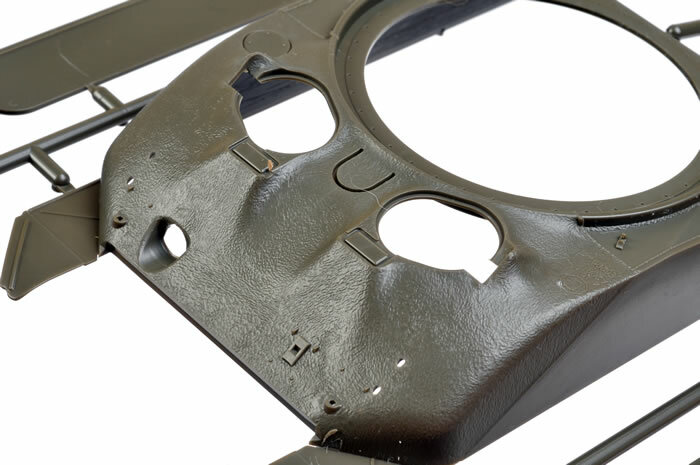 The 1C Firefly (both Hybrid and Welded) had unique stowage bins designed for them because the standard VC stowage bin could not be fitted as it covered the crank handle socket although Some were ingeniously fitted and hinged to allow access. 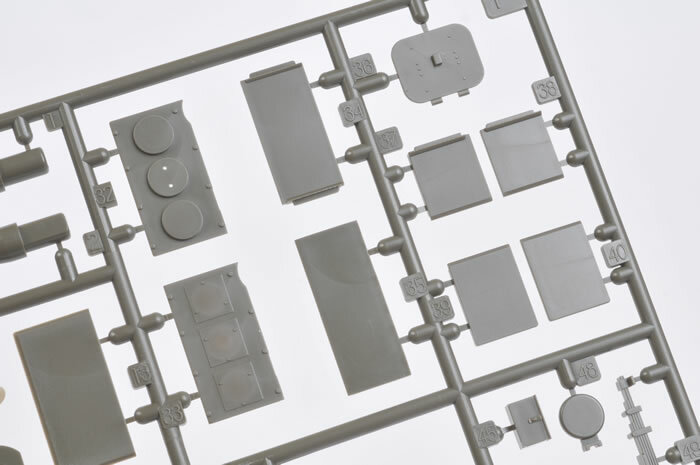 The kit does not include the unique stowage boxes located on the upper hull. The hull first aid kit is supplied however. None of the examples have turret markings and all are in SCC15 overall. 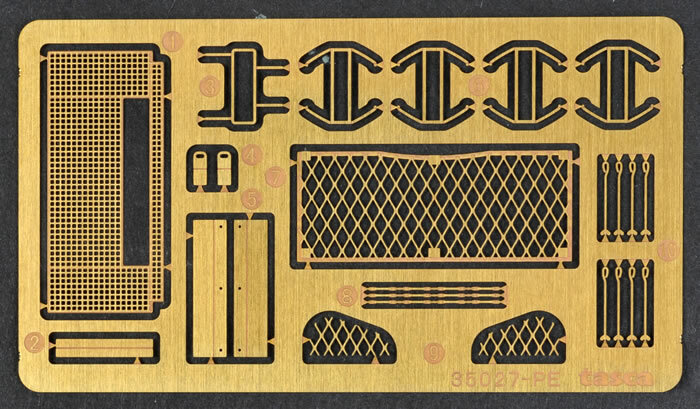 A decal is supplied for the counter shade on the Gun Barrel. The instructions are typical Tasca and easy to follow. A separate painting guide is supplied along with an errata for the instructions regarding the Extinguisher fitting and the exhaust placement. 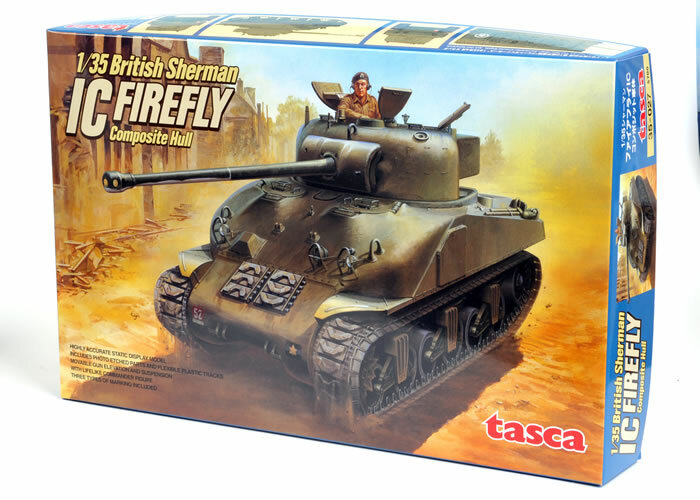 This Tasca’s 3rd Firefly kit and its first M4 variant. It offers a very well engineered rendition of a typical early Composite Firefly. It is not without omissions but what omissions are listed above are all within the easy reach of the modeller and after exhaustive comparison I believe they have got the complex shape and placement of the composite hull features spot on to the real thing (excluding the omissions). IMHO I believe it is more accurate in outline than the DML one and certainly has much better fit. Considering the marking options available with the 1c Hybrid I feel the kit is light on however I would suspect further variants of the 1c to be released by TASCA as time goes on. I am also hopeful for further M4 (both Welded and Composite) to be released. Certainly a late 1c with the High Bustle turret would be a great addition to the family as the turret could be used on both the M4A1 and M4A3 already in the range. Even so, this is still a great kit and a very welcome release.